As all of the school year activities wind down, and some fun summer times begin, take a step back from it all and zoom in on the moments with your telephoto zoom lens. Not only will you get some more natural expressions, but your subjects will really stand out from the background with your tele lens setting. At the end of the last soccer game of the season, I remained at the side lines while the coaches gave encouragement and praise to their players and zoomed in. I caught a very natural expression on both coach and player. Additionally, while outdoors this summer, pay attention to where the sun is. Try to shoot later in the day when the sun is not so harsh. And look where the sun is hitting your subjects. Here, the sun is lower in the sky and behind the team, which adds a nice rim light to their hair and shoulders. In this lighting situation, set your camera to spot meter, as I did here, to be sure the camera gives the proper exposure for your subjects, and does not “put on sunglasses” because of the bright light behind and make your subjects darker than desired. Look for the metering button on your camera and turn it to spot. 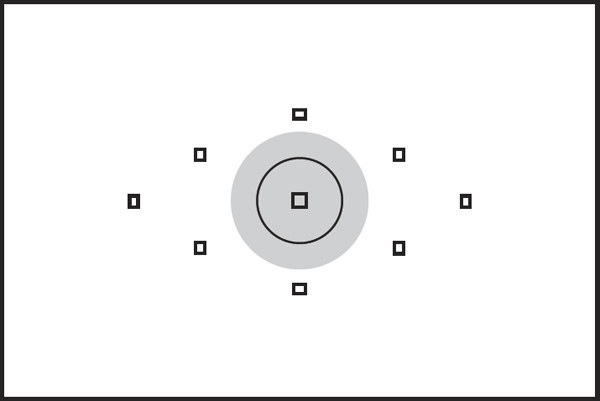 When you look through your viewfinder, you will see a the smallest of circles in the center of the frame (see below). Be sure this circle is on your subject, press and hold your shutter release button half way to lock in both focus and exposure, adjust your composition if necessary, and then take the shot by pressing the button the rest of the way. 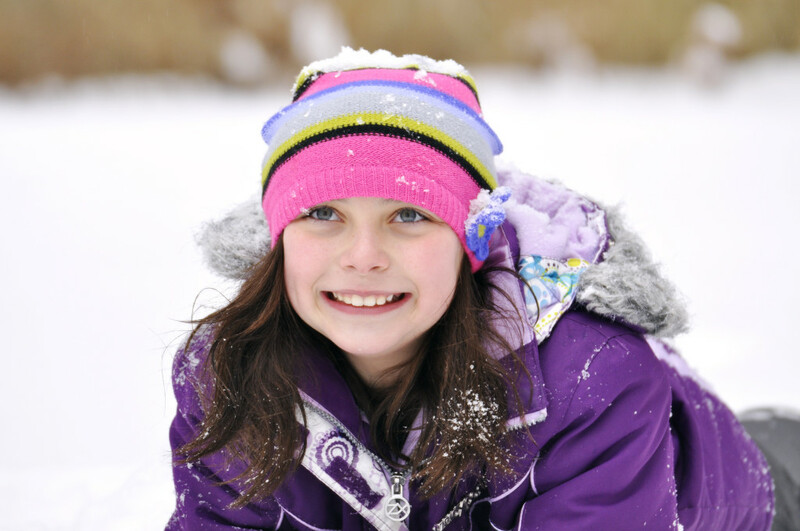 We had just one snow storm this winter, so just one day to get out and play in the snow with my camera. Snow tends to fool your camera’s meter since the snow is so bright, making the camera under-exposure your snowy pics. My analogy is that your camera wants to put on a pair of sunglasses to cut the brightness. To get a better exposure, start by setting your camera’s exposure compensation dial to +.67 (2/3 of a stop). Most of the time this does the trick, but you can even go to +1.0. (Read about exposure compensation here and here). Your snow will be bright white instead of gray-looking. For this picture, I set the exposure to +.67. I was further away from my subject and got down low to eliminate the distracting fence and bare branches in the background. 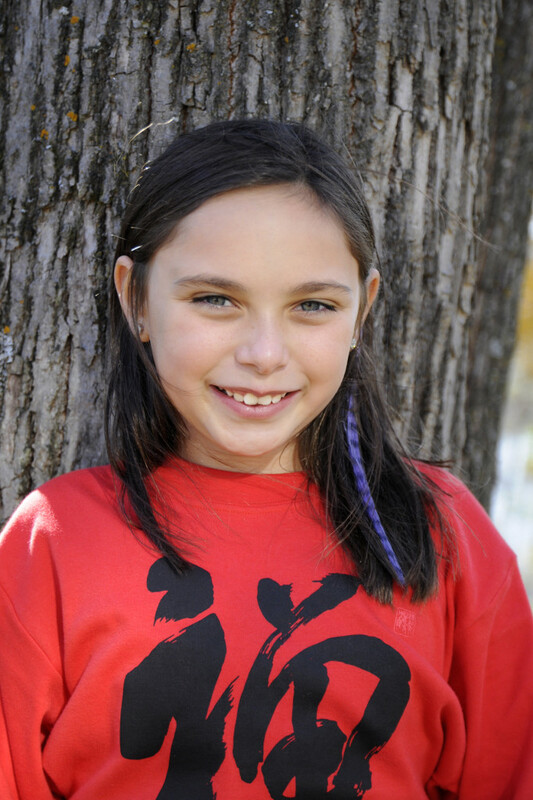 I also set my aperture to a wide opening of F/5.0 and zoomed in to 185mm telephoto to blur the background. I love the snow crystals on her hat. I feel chilly just looking at this photo! Please take note that if you are lucky enough to get away to a beach destination this winter, this same tip works for bright sand and water, too. Here, I zoomed out to 110mm to get more snow in the photo. 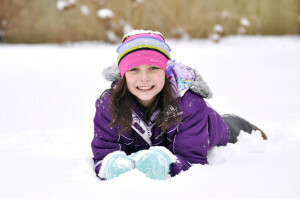 Now that winter is here, you’ll find yourself outside with the kids on the next snowy day. 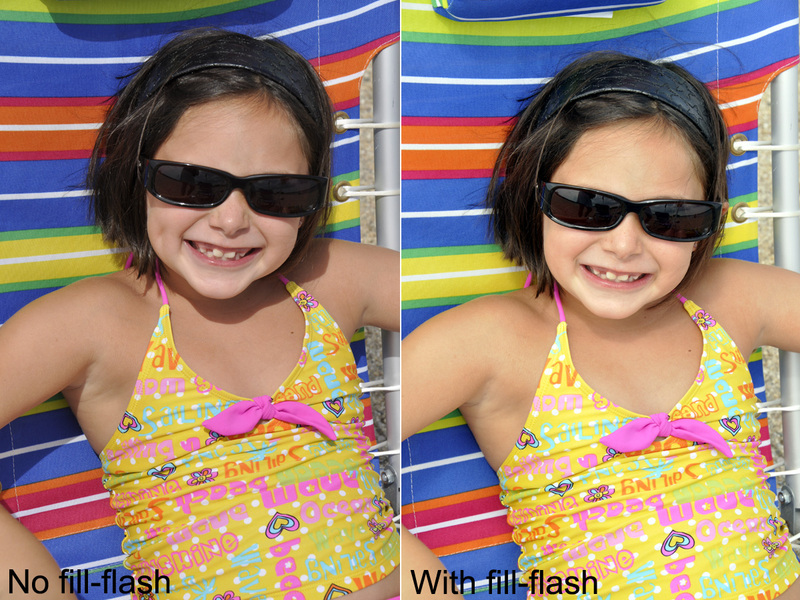 A good time to practice slowing down your shutter speed to create fun effects! By putting your camera on aperture priority mode (A on the mode dial)and moving your aperture (or f-stop) to a larger number like F/8, you will get a slower shutter speed. Since it is usually overcast when it is snowing, this aperture setting should be about right, but feel free to make the aperture even larger, or open up a little bit (move to a smaller number like F/6.3 or F/5.6). In this photo, the exposure was 1/40th sec. at F/6.3— just enough to make the very light snow turn into short streaks, but still fast enough to keep my subject in focus if she moved slightly. I used the stabilization feature on my lens, so camera shake was not a worry, but you will want to be sure that the shutter speed does not drop to slower than 1/30th sec. or else you do risk camera shake without a stabilization feature. If your subjects are jumping around considerably, this technique may not work. 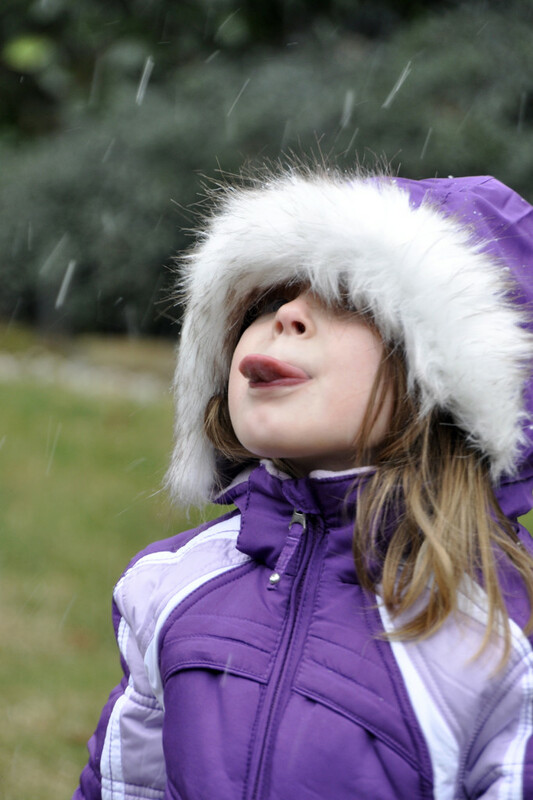 I asked my subject to catch snowflakes with her tongue, which made her stand still and concentrate on the activity. Slower shutter speeds (typically those under 1/125th sec.) 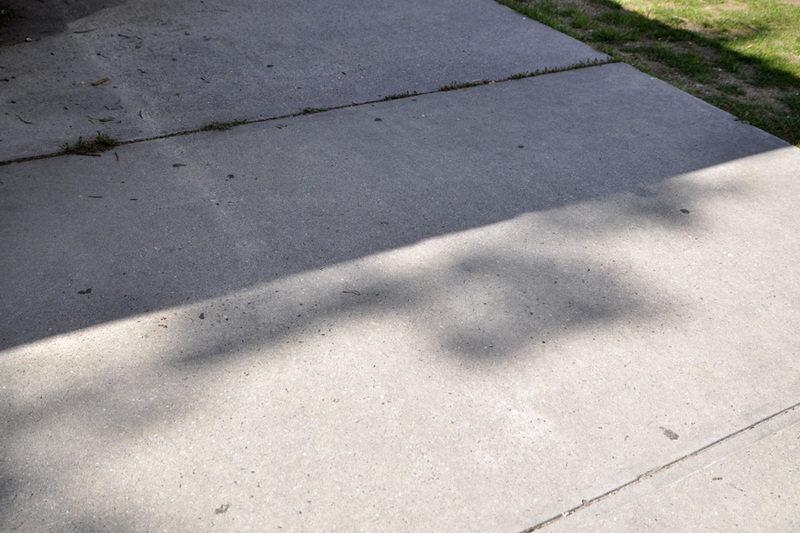 can help convey motion, and this same technique should be used to make water streaks under a sprinkler or from a hose or for waterfalls. 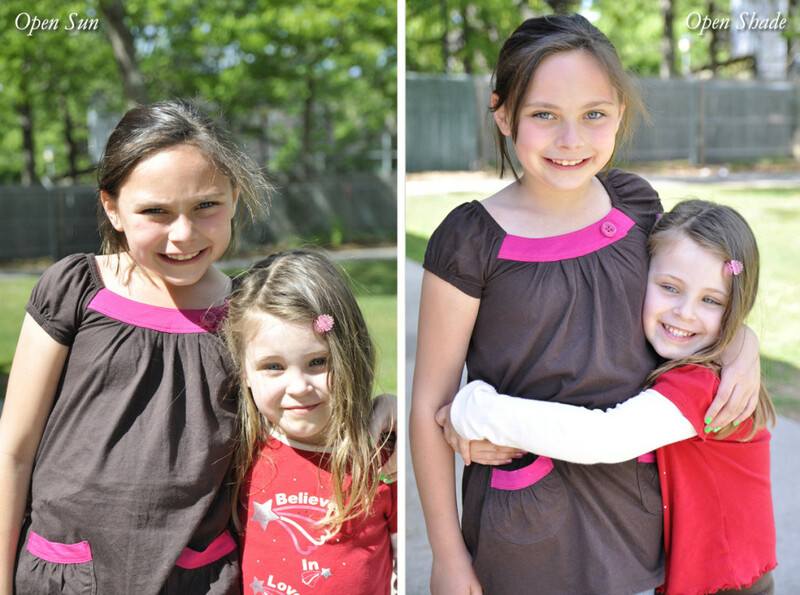 Read more about freezing and blurring motion here and here. On a beautiful fall day, I posed my subject next to a tree facing the back of the house, which acted as a reflector. The sun bounced off the house and lit the girl’s face and gave her a really nice highlight in each eye. Reflectors can be any white or near white surface, such as a painted brick wall, a sign on a door, or more. Position your subject in the path of the light as it bounces naturally off the “reflector.” If you are in a place where there is no structure that can act as a reflector, then break out a white piece of foam core or oat tag to bounce light back into your subject’s face and eyes. If you love this technique for posed portraits, then you might consider buying a reflector from your local camera store. So look around to see not only where the light is coming from, but what it is bouncing off. The lit leaves in the background add some drama. It’s finally summer! And if your family’s like mine, beach figures heavily into the weekend. 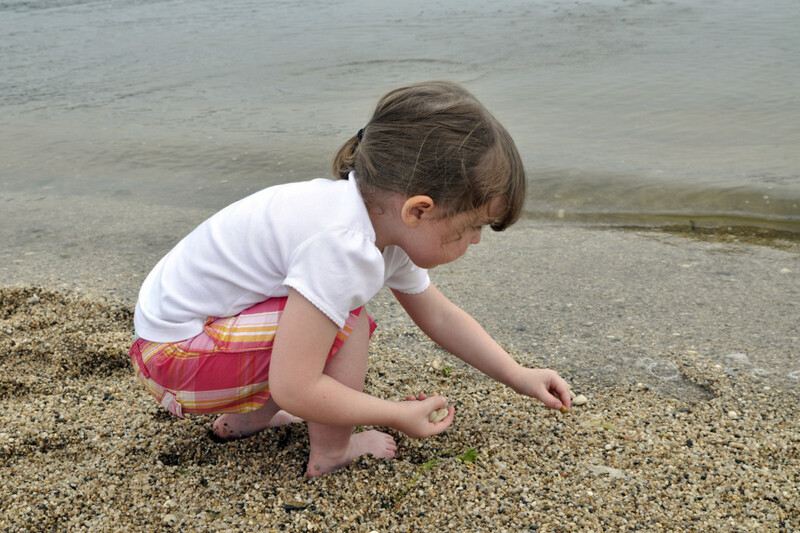 If you have young children that love to explore the beach, then get down on the sand with them. 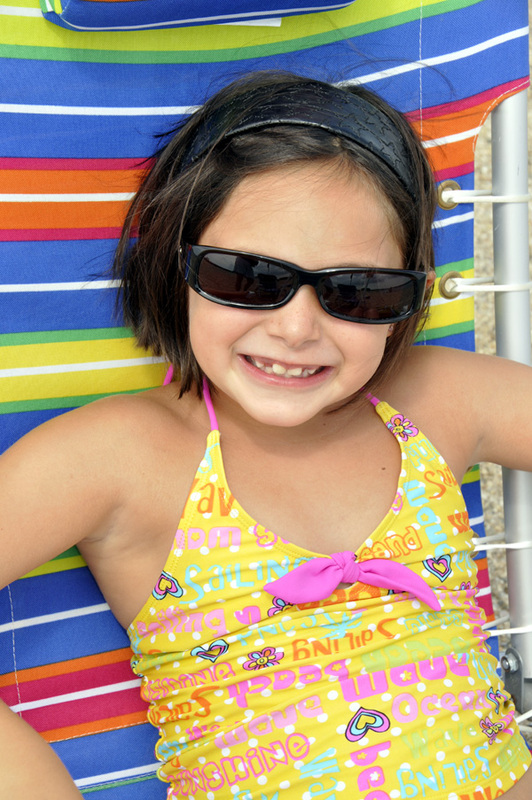 Make sure to bring a towel so that you can easily sit or even lay down close by in order to capture their explorations (and to keep sand on your hands to a minimum). Getting close and using a wide angle setting on your lens lets you show some more background to give a point of reference (see photos below). 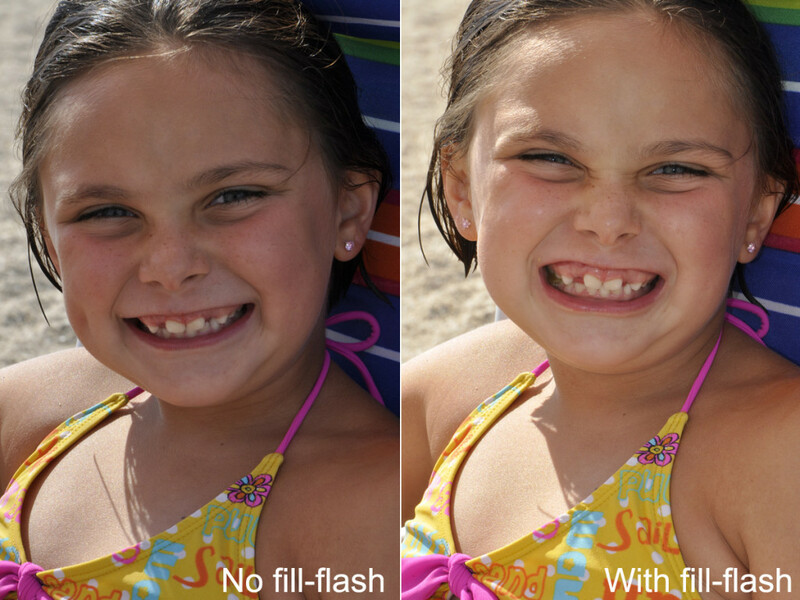 On bright sunny days, trying popping up your flash for some fill to eliminate harsh shadows from midday sun, and to add some light to your child’s face often hidden by cute sun hats. But don’t let cloudy days like we had here stop you form heading to the beach with your camera. The over cast sky is actually perfect for picture-taking. One note of caution: Salt water is an enemy of you camera. If the conditions are very “moist” on a hot hazy beach day, salt residue and water can collect on your camera and lens pretty quickly. Try putting your camera in a zip lock bag with a hole cut out for the front of the lens to stick out and be sure to use a UV filter. Clean the lens as soon as you can with lens cleaning fluid and a micro fiber cloth taking extra care to inspect for and remove any sand that may be on your lens before rubbing the lens. Then wash the cloth before using again after the beach. Store the camera back in your camera bag right after use to keep it out of the sun and elements. There are also special bags made for your camera to prevent any damage. Google rain coats for cameras. During winter break, we spent a few days in sunny and warm California. Our trip to Hollywood was brief and pictures were difficult with so many people on the crowded boulevard that was in full set-up mode for the Academy Awards. 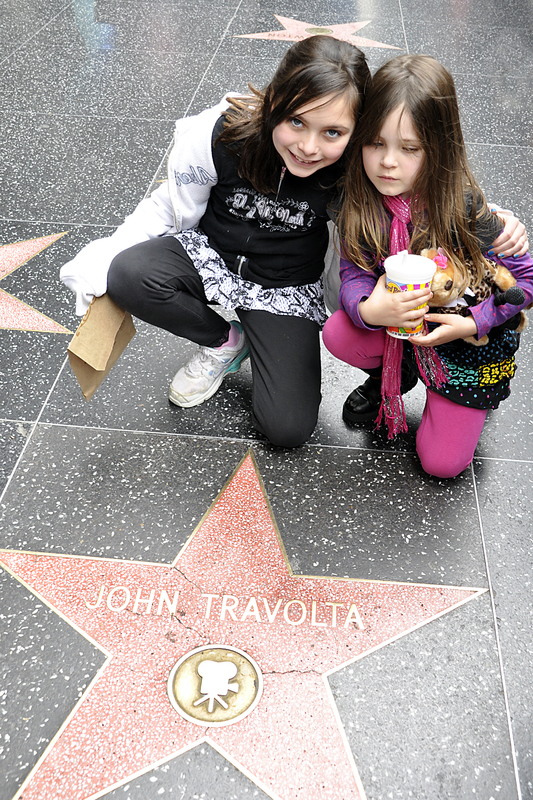 And with two kids all too anxious to see the sights, I had just a moment to capture a “we are here” photo in front of a star on the Hollywood Walk of Fame. By setting my lens to a 23mm wideangle setting, getting close to them and tilting down on the scene, I was able to quickly eliminate the people in the background while still capturing their expressions and John Travolta’s star. I used a slightly small F/6.3 aperture, that when combined with the wide focal length, kept both the star and the kids in focus. Be sure to focus on the subjects eyes and then tilt down for your best exposure and to keep the most important focus point sharp. (Note: I did Photoshop out one lingering foot of a Storm Trooper from the upper right side of the frame. Don’t be afraid to crop or retouch to make your photo even better before posting, framing, scrapbooking or adding to an album). Better Holiday Snapshots Article Features Photos and Tips From Yours Truly! I was honored to be asked by Stephanie from LifetimeMoms.com to write up some tips on how to take better photos over the holiday season. Well, that season officially starts next week and there are a few tips in that article that will come in handy at your Thanksgiving gathering. Or as you think about snapping away over the extended weekend trying to get the perfect photo for your holiday card. 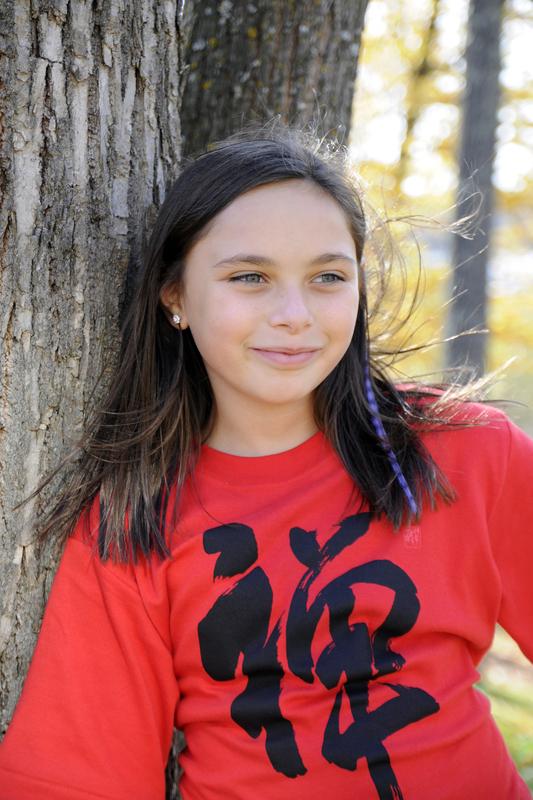 Please take a look at the article by clicking here. And thanks Stephanie!